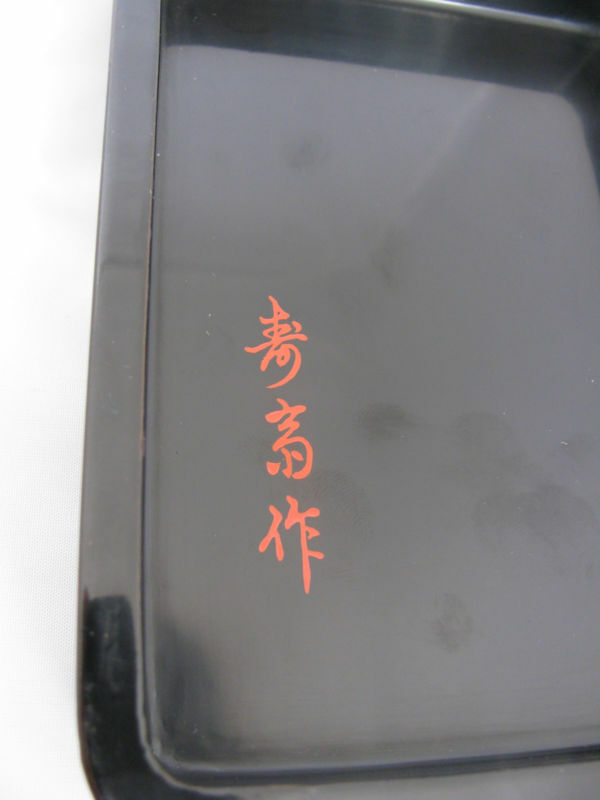 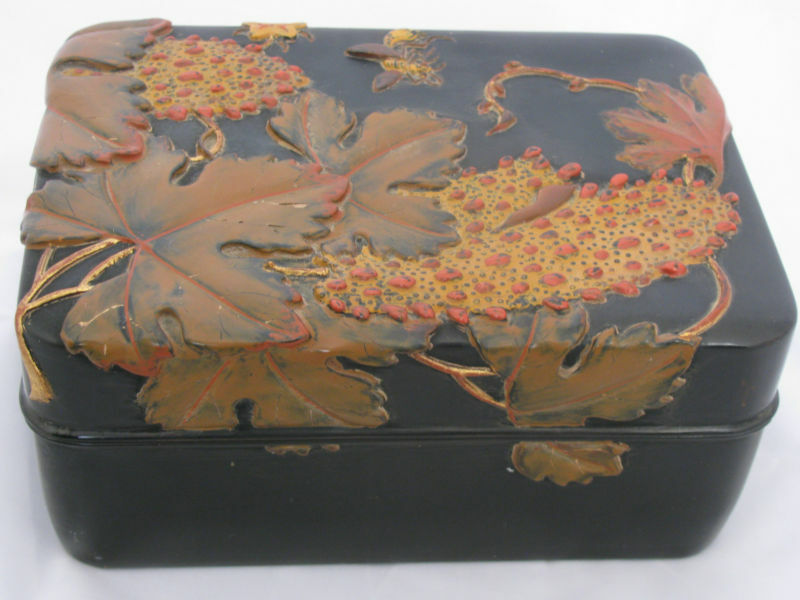 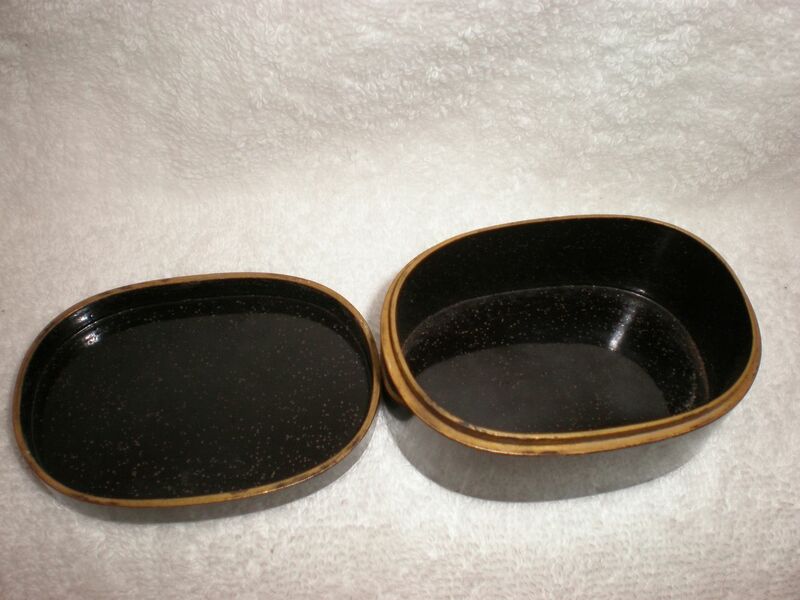 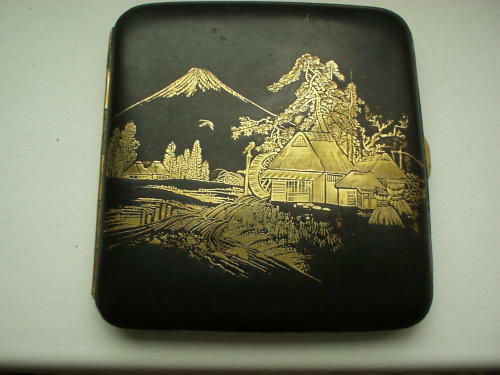 Black Lacquer Japanese Wooden Box used to hold papers. 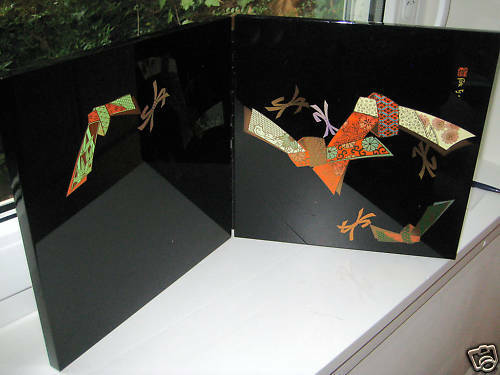 A few lacquer chips around the edges. 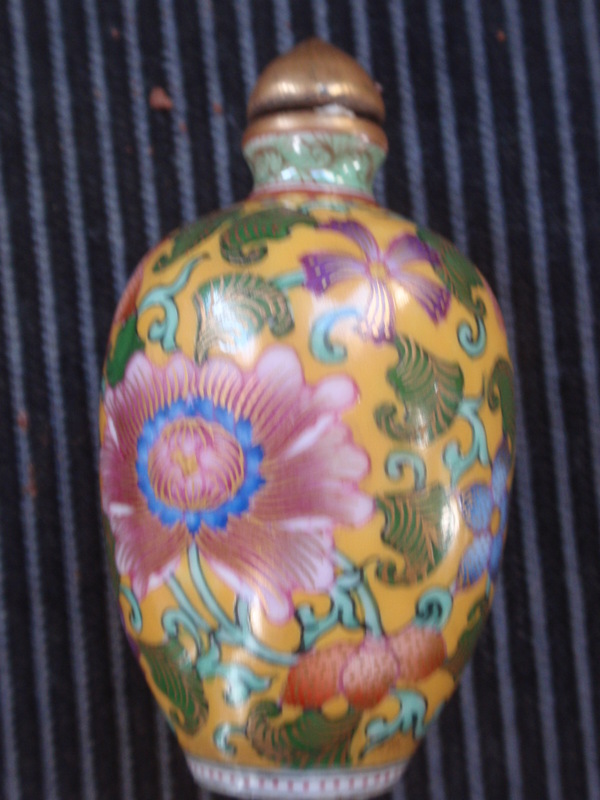 Age and origin unknown but a nice item. 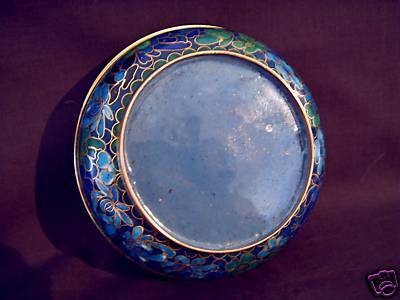 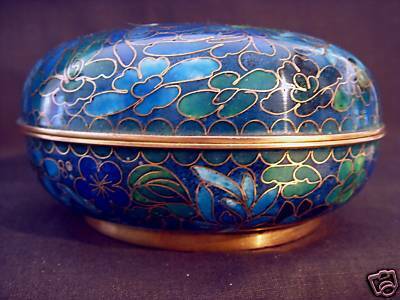 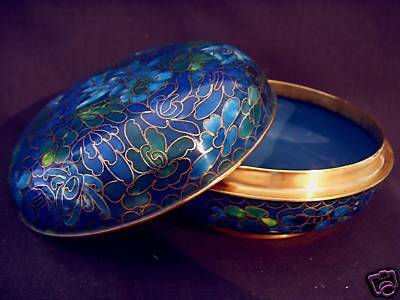 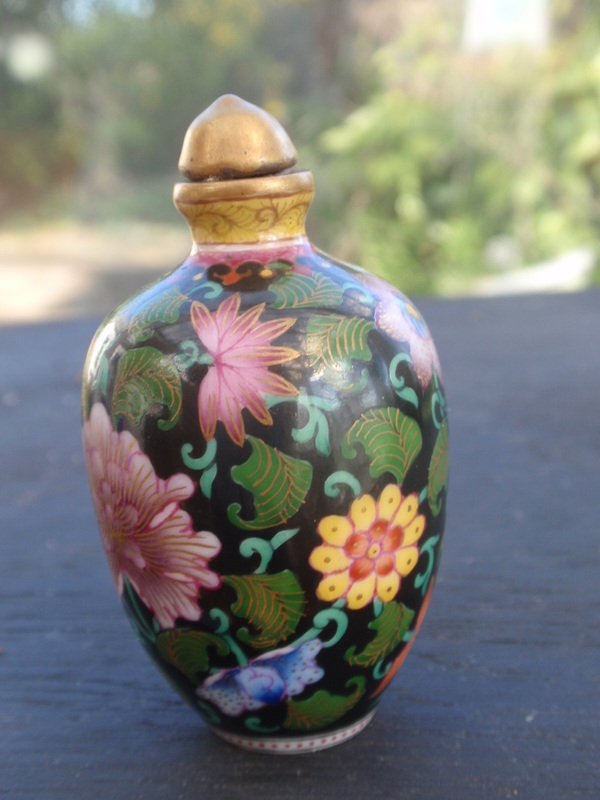 EARLY 20thC JAPANESE CLOISONNE TABLE BRASS TRINKET BOX. 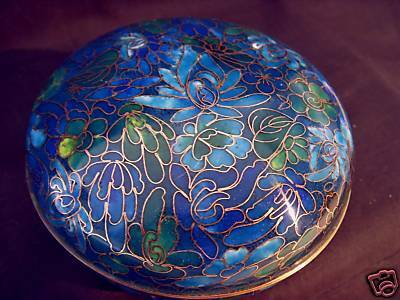 MEASURING 4" IN DIAMETER APPROX & STANDING 2" HIGH.....WITH THE MAIN COLOUR OF THE ENAMELING BEING DARK BLUE WITH THE LOTUS FLOWERS A LITTLE LITGHTER BLUE, AND WITH HINTS OF GREEN AROUND THE FOLIAGE .....THE GOLD GILT OVER THE BRASS IS STILL COMPLETE ON THE BASE AND THE TWO RIMS........THE CONDITION IS EXCELLENT FREE FROM ANY DAMAGE. 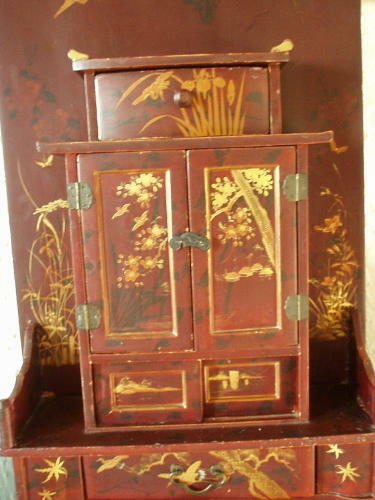 ANTIQUE JAPANESE LACQUERED MINIATURE CABINET WITH DOORS AND DRAWERS. 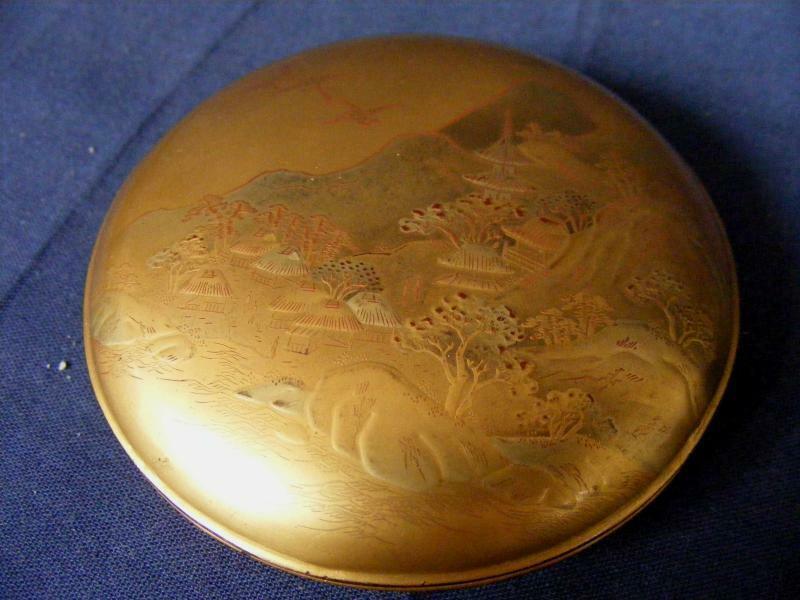 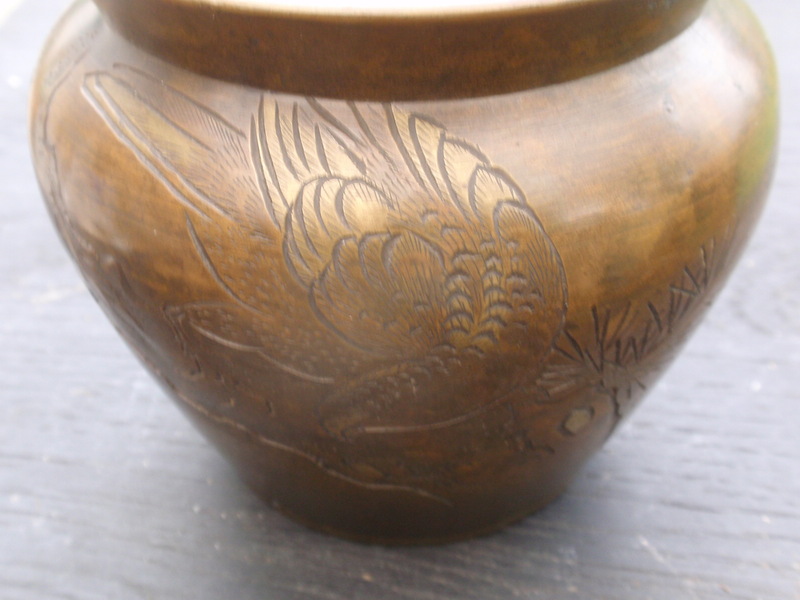 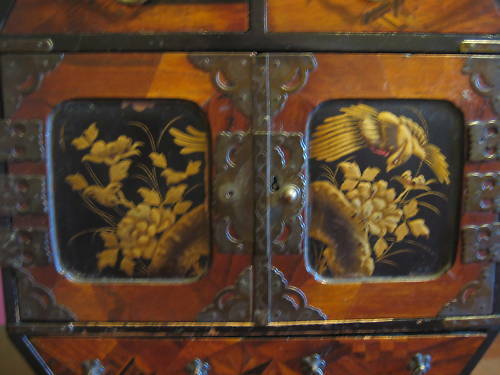 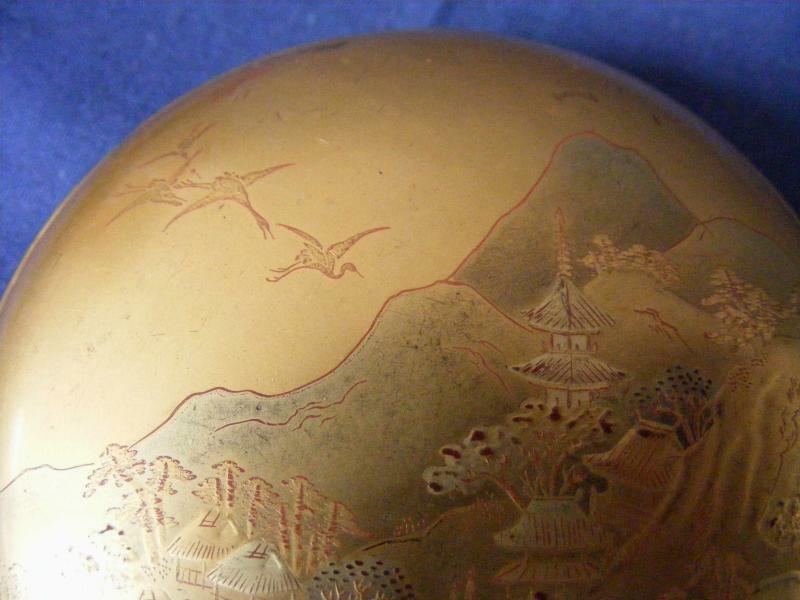 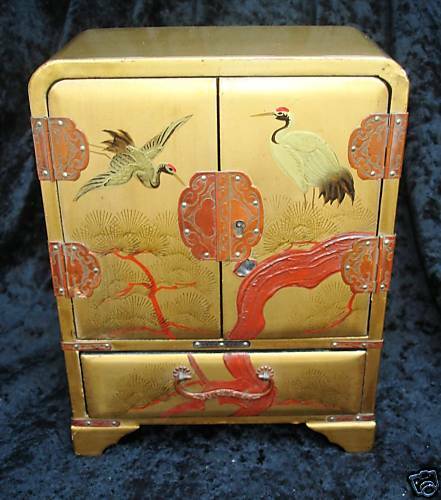 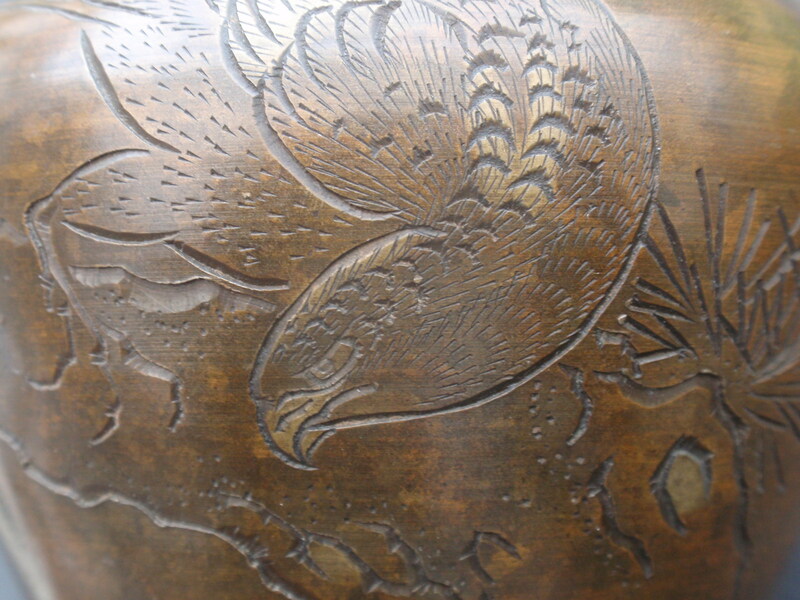 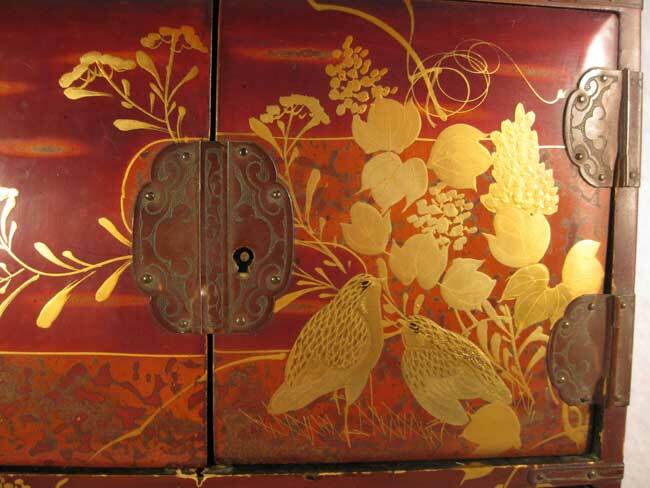 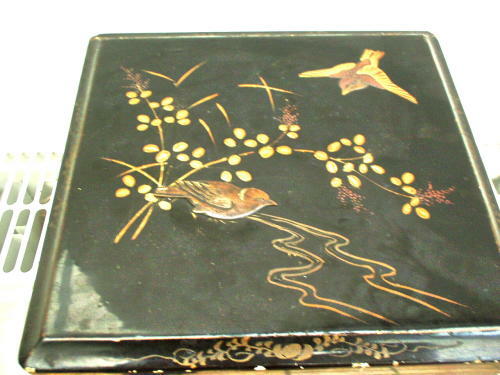 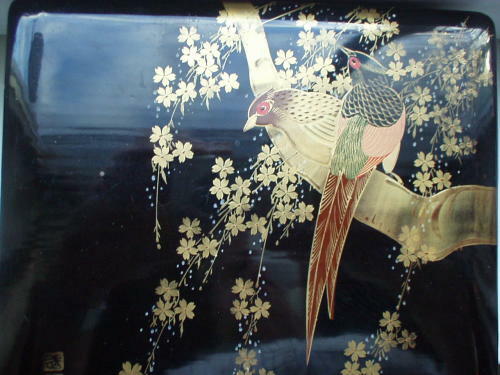 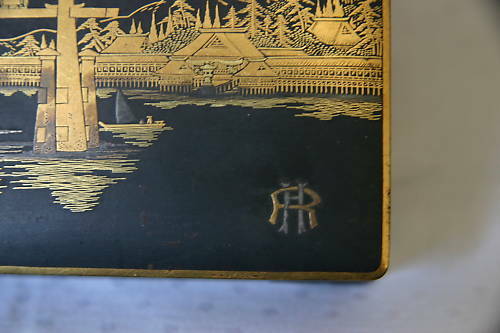 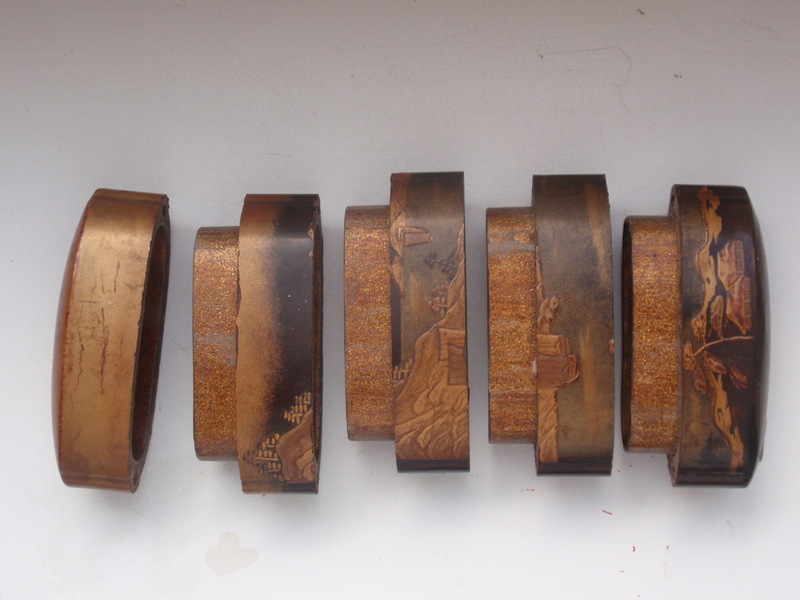 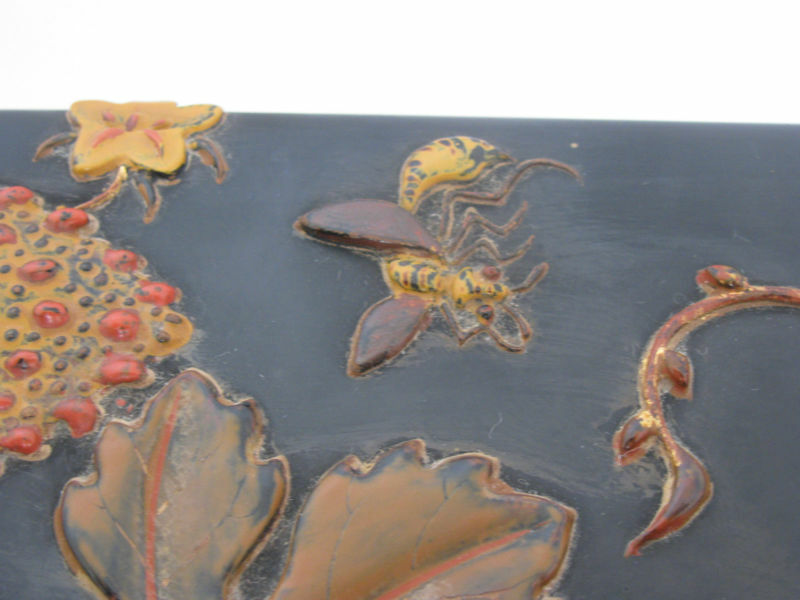 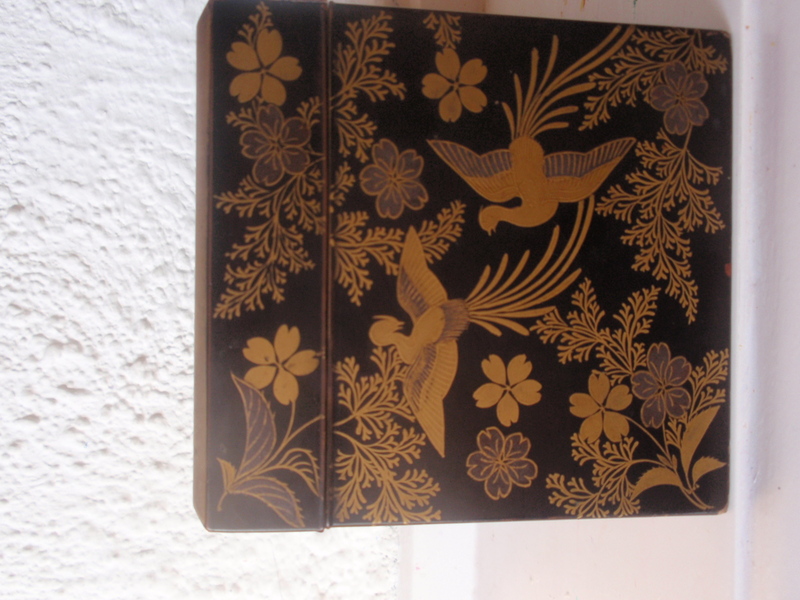 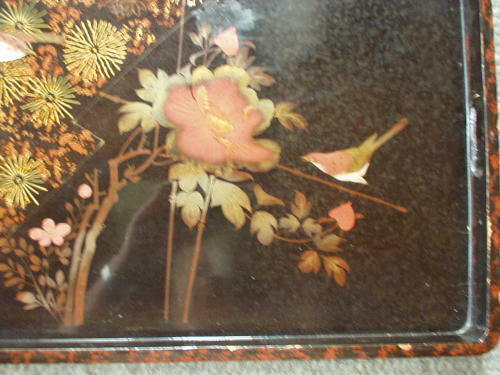 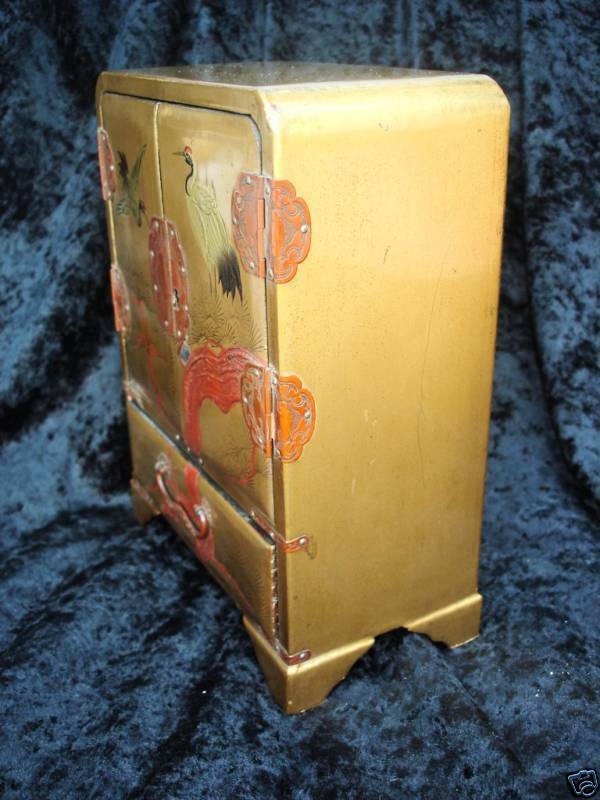 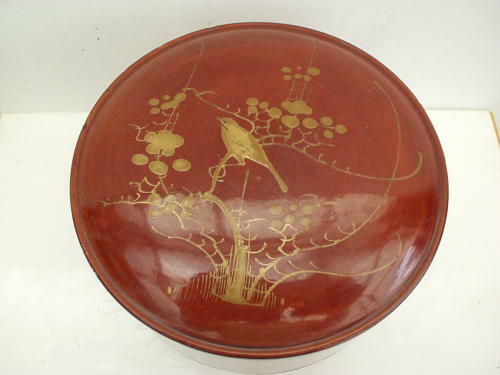 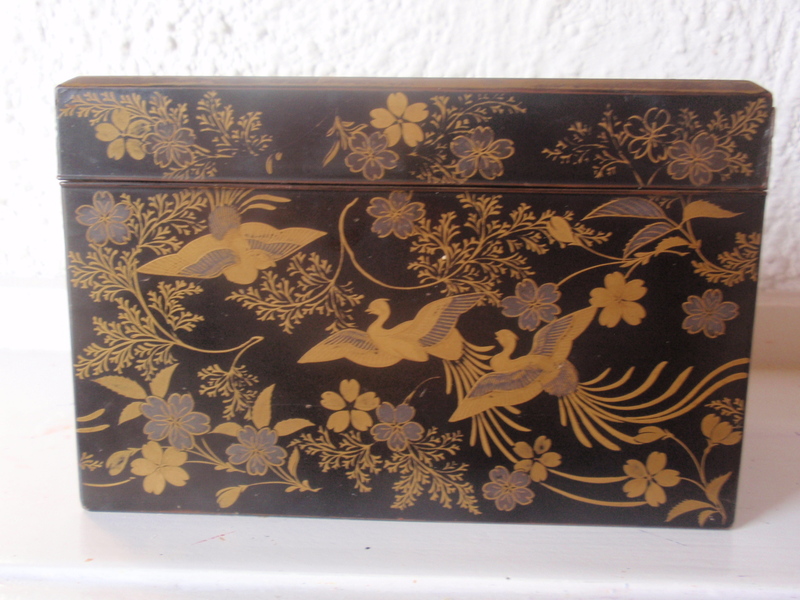 IT IS DECORATED ON THE OUTSIDE WITH TREES AND BIRDS ON A GOLD GROUND LACQUER. 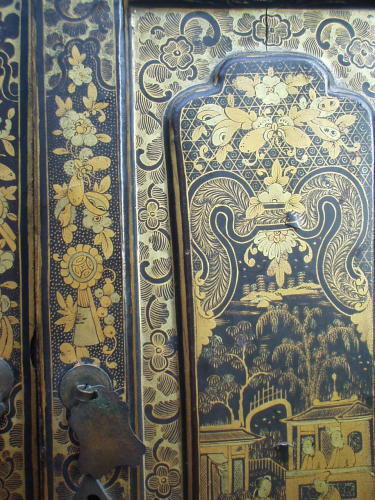 THE INTERIOR IS DECORATED WITH FLOWERS ON A BLACK LACQUERED GROUND. 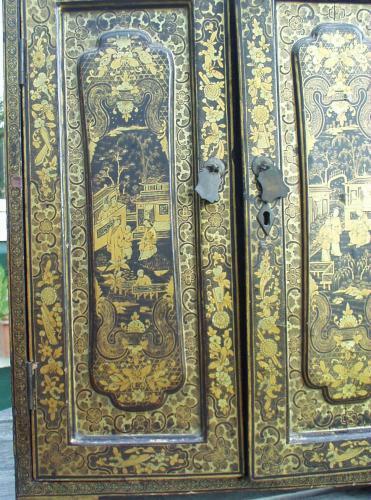 THERE ARE APPLIED BRONZE HINGES AND STRAPWORK WHICH ARE DECORATED WITH ENGRAVED SCROLLING. 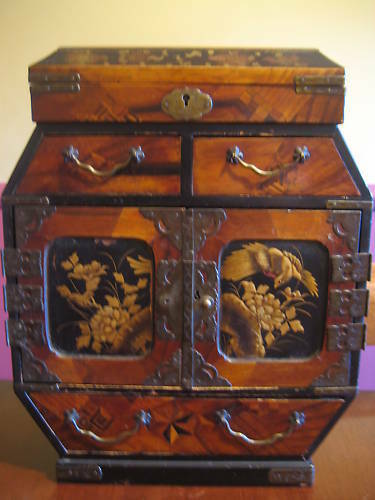 THE CABINET IS 19 CMS HIGH, 14.5 CMS WIDE AND 7.5 CMS DEEP. 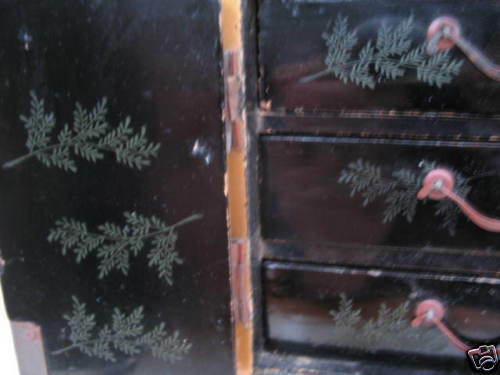 THERE IS A SCUFF TO THE LEFT SIDE OF CABINET AND SOME LOSS OF LACQUER TO THE BACK FEET, MENTIONED FOR ACCURACY, BUT DOES NOT DETRACT FROM THE BEAUTY OF THE PIECE. 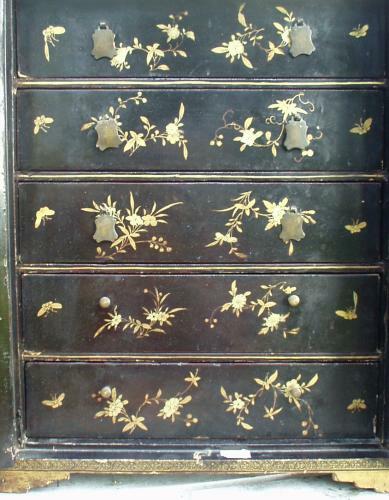 THERE ARE THREE DRAWERS INSIDE AND A KEY WHICH LOCKS THE DOORS. 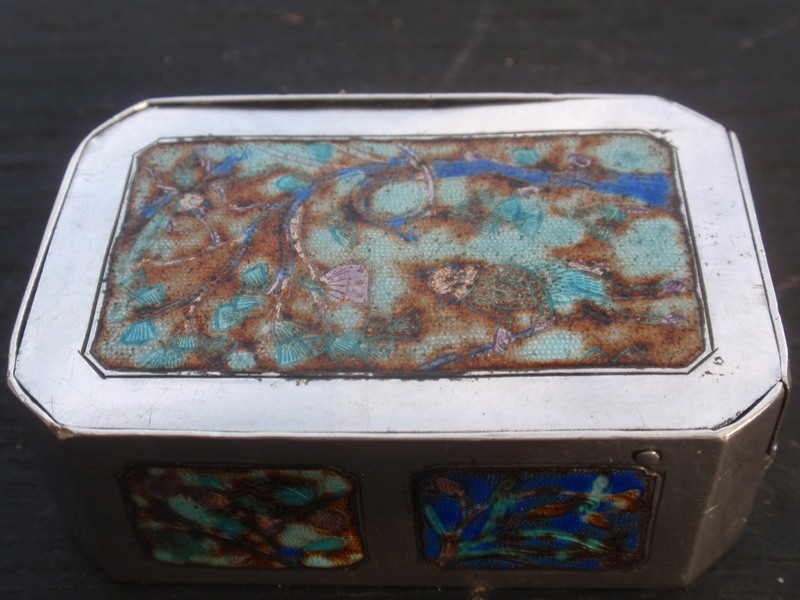 THIS WOULD MAKE A GREAT JEWEL BOX. 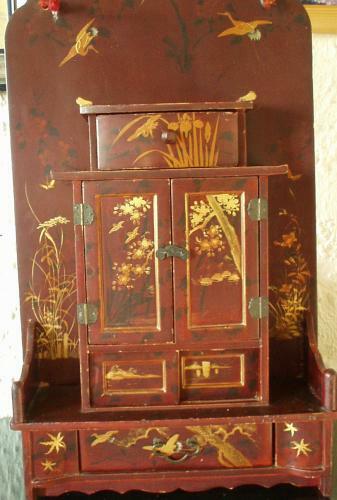 ANTIQUE JAPANESE LAQUERED TABLE CABINET. 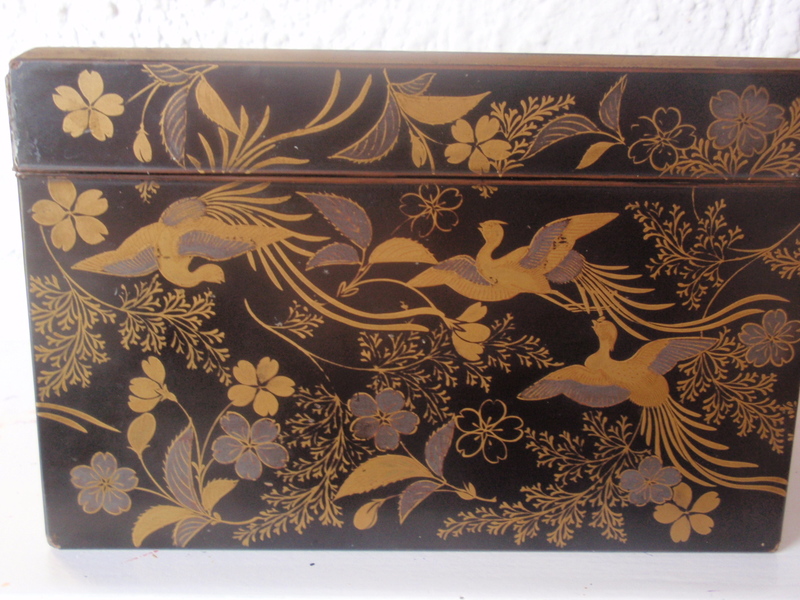 DECORATED WITH INLAYED PANELS TO THE DOORS WITH BIRDS AND FOLIAGE 7 INLAYED DRAWS IN TOTAL AND A TOP SECTION WITH COMPARTMENTS AS SEEN. 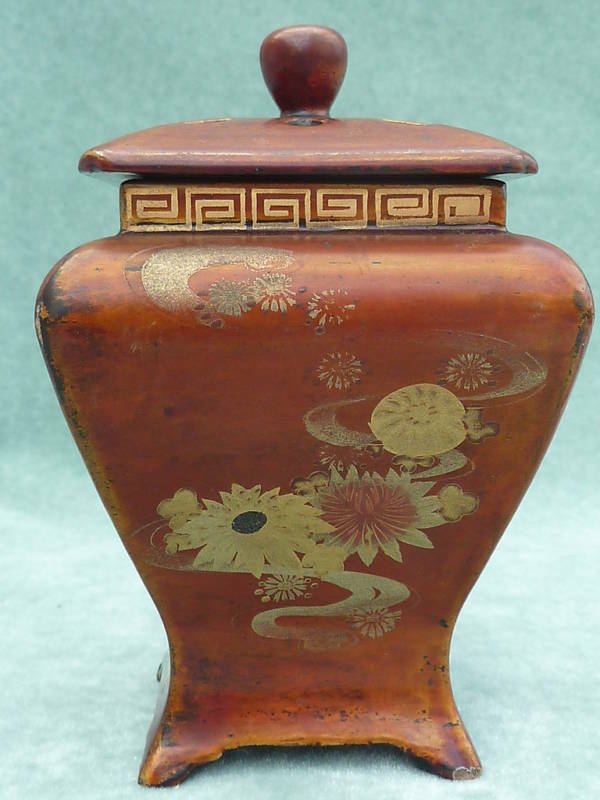 30cm TALL x 24cm WIDE x 11cm DEEP. 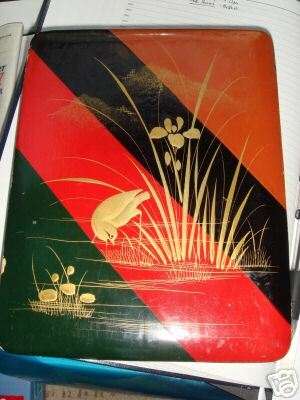 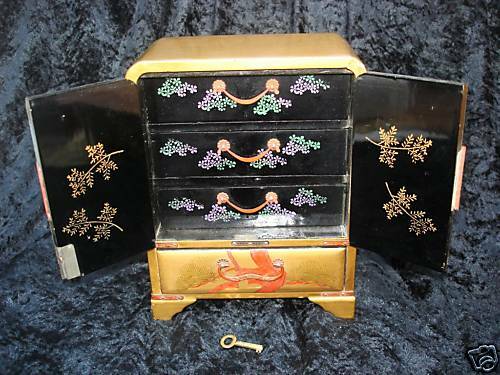 Old black lacquer box with bright art deco design painted on lid, and unusual two-tone escutcheon (no key). 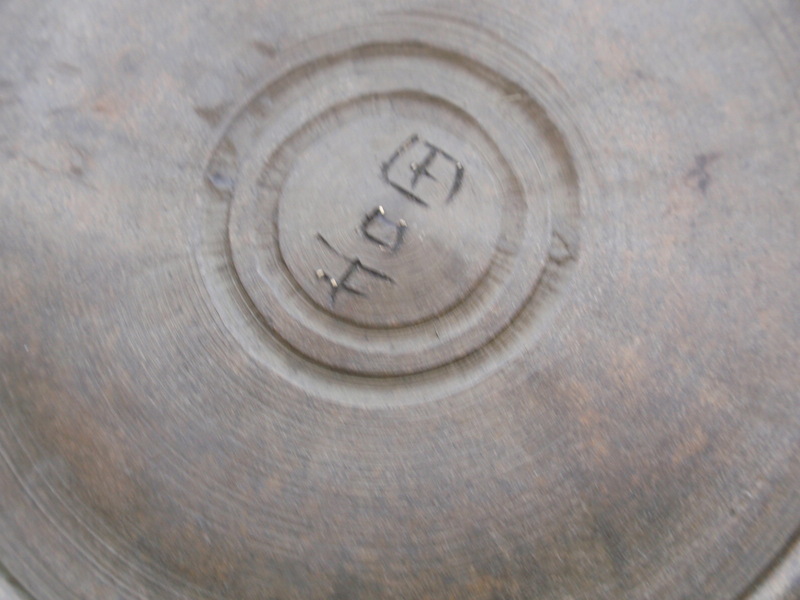 There is some slight wear on the edges as shown in photos. 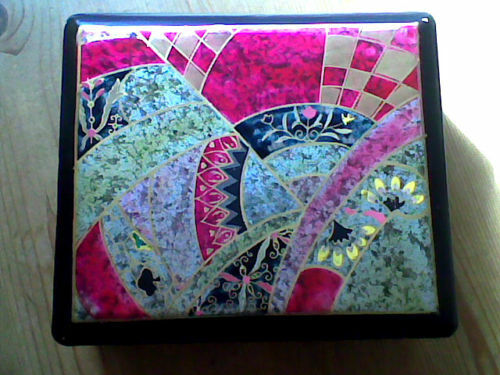 The box measures 17.5 x 15 x 5.75 cms. 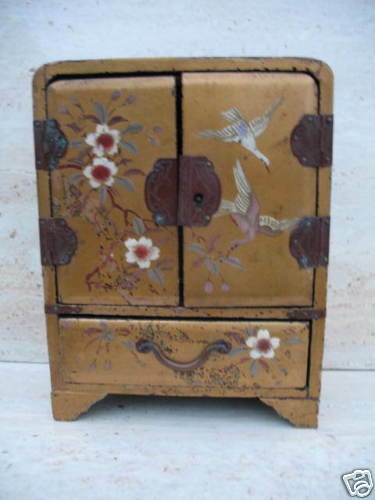 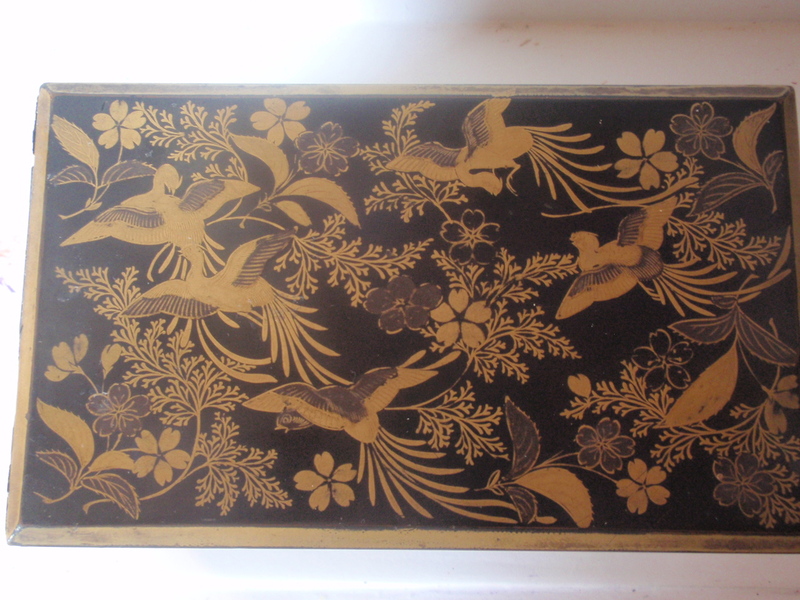 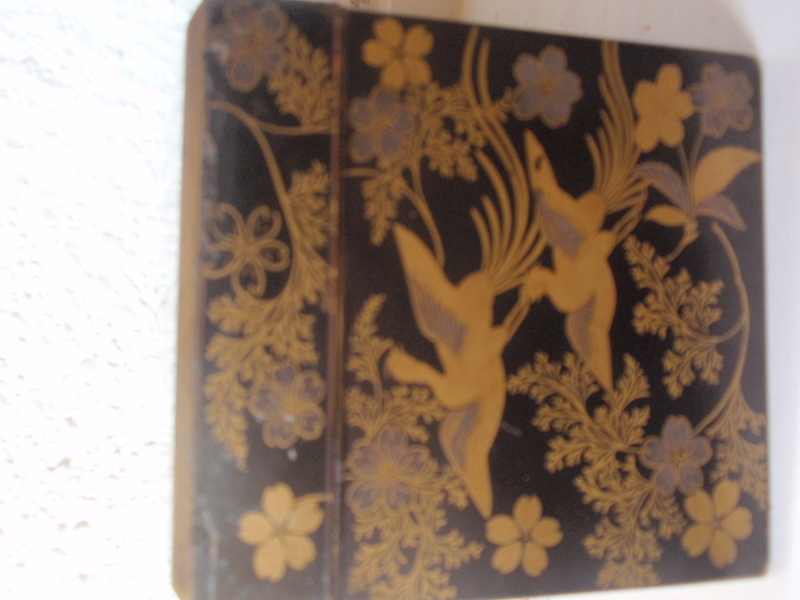 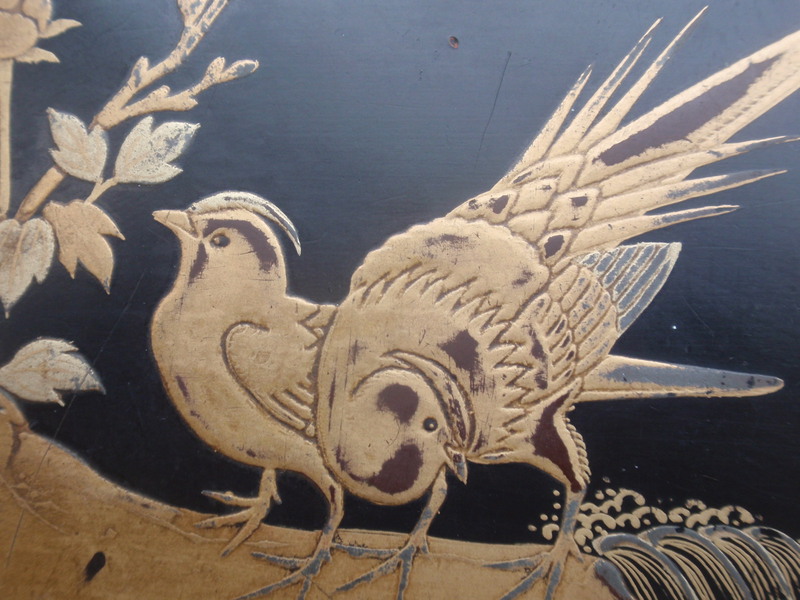 A pretty late 19th century black lacquer Japanese trinket chest /box with exotic gilt metal birds on the top. 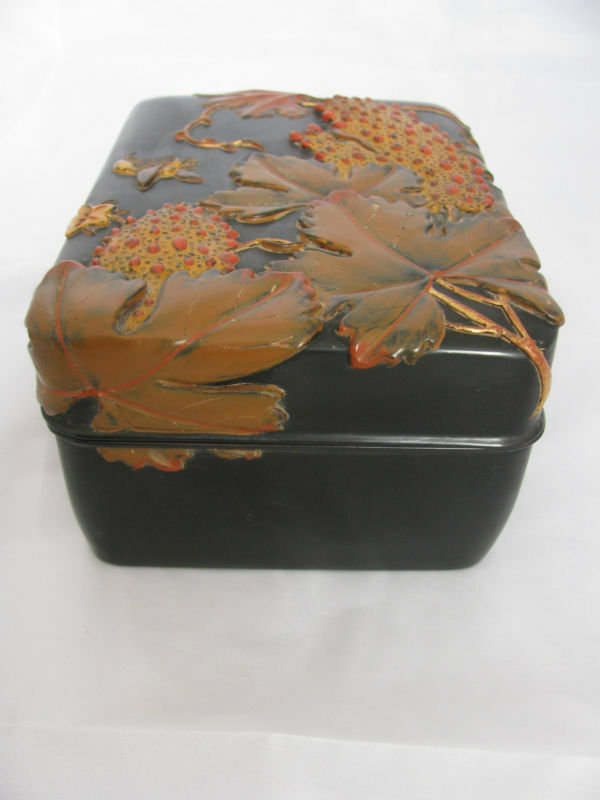 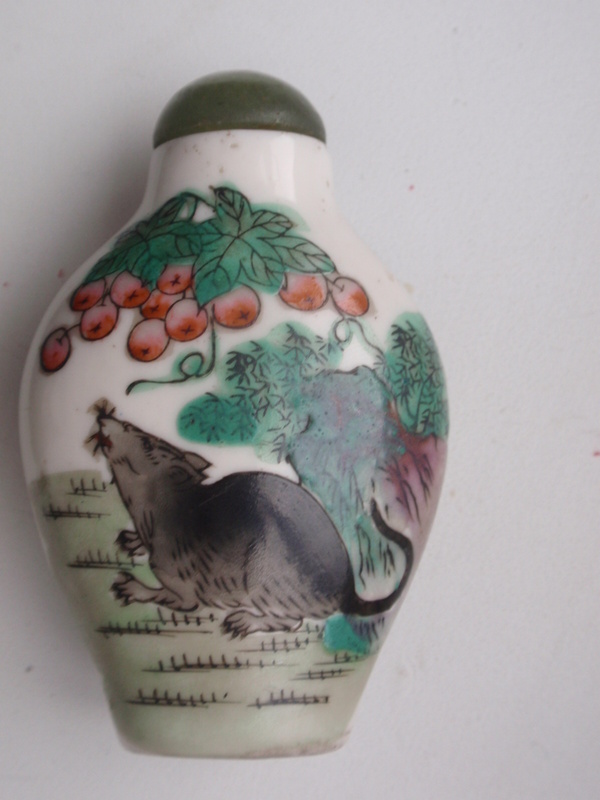 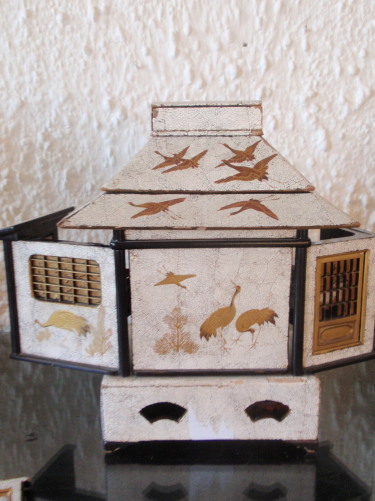 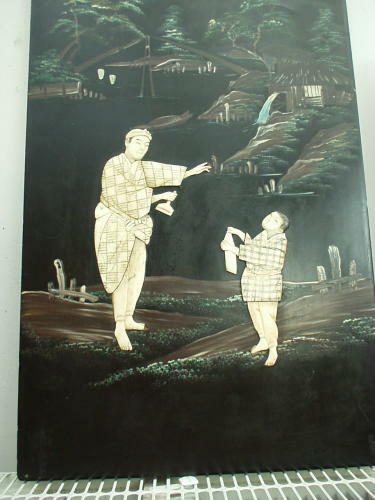 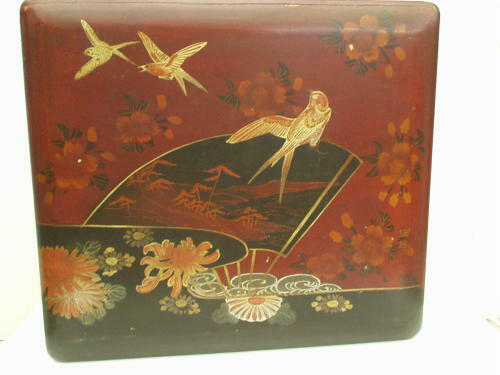 Japanese papier mache lacquer box and cover, measuring 4 1/2 inches tall, and offered for sale in excellent condition, free from chips, cracks or repair. 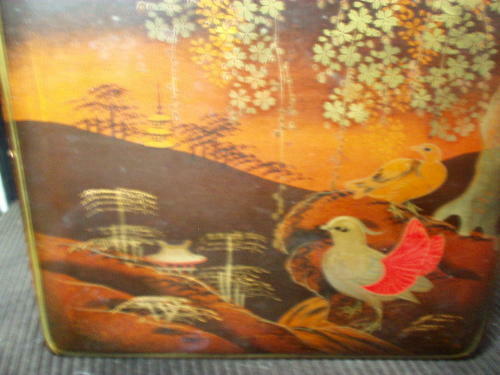 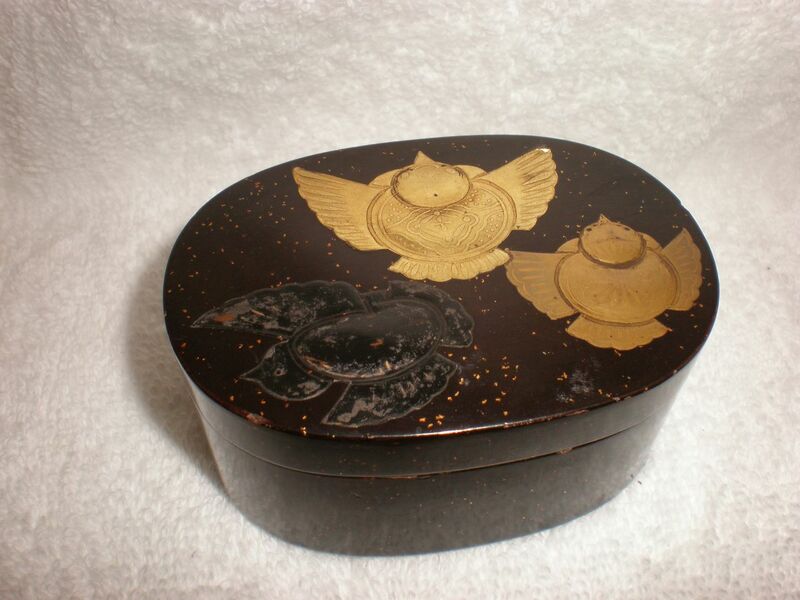 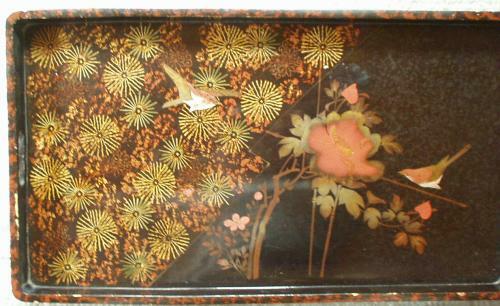 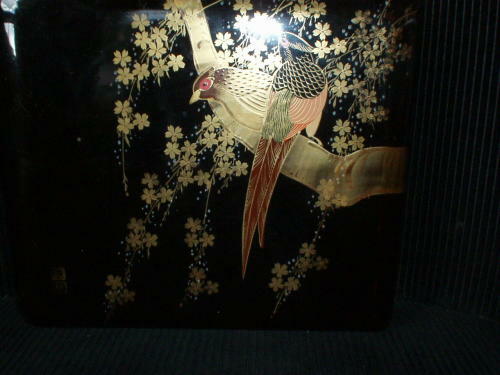 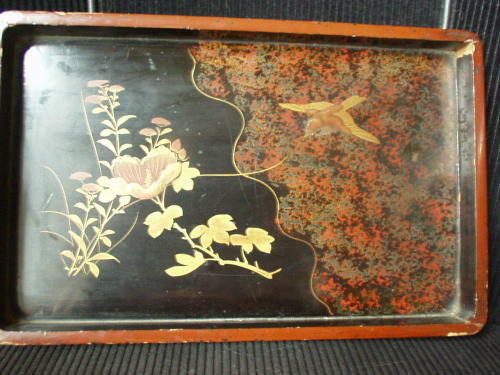 Antique Japanese butterfly makie shibayama trinket box. 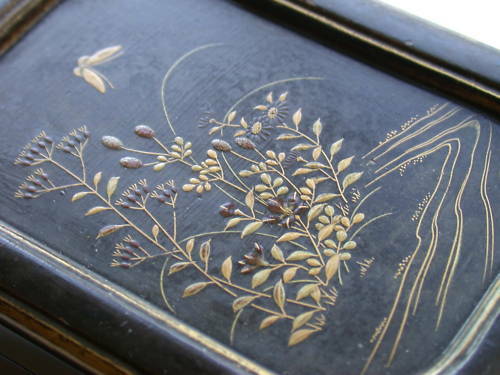 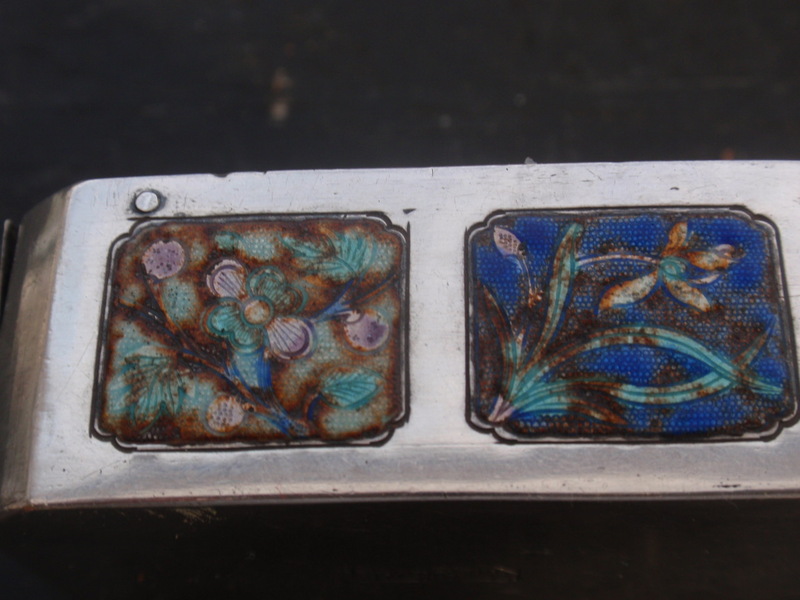 This lovely old box has a nicely inlet top containing a stunning picture of a butterfly over leaves and flowers by a stream, all painted in incredibly fine detail. 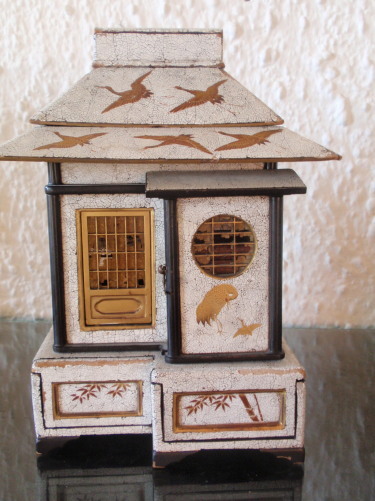 Very nicely made with makie gold flecks to the inside and base, made from papier mache. 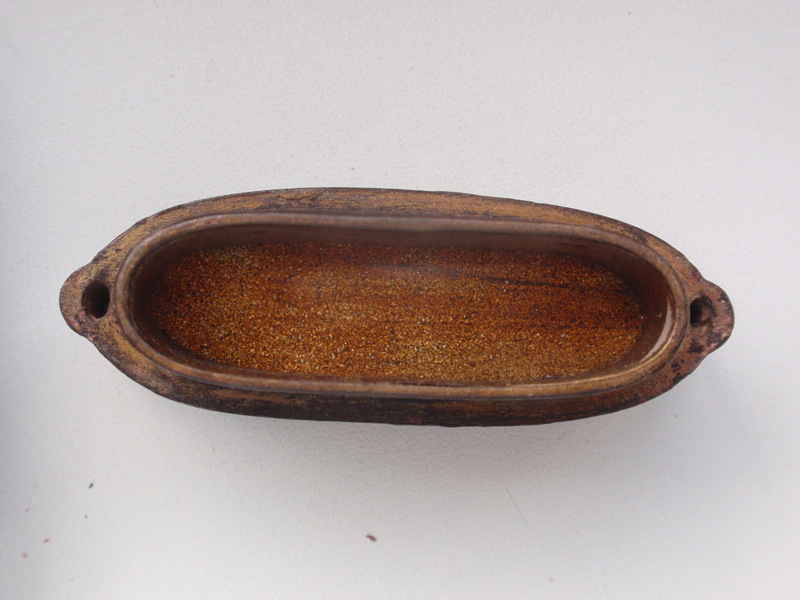 It measures 4 1/4" long x 3" accross x 71 3/4" deep. 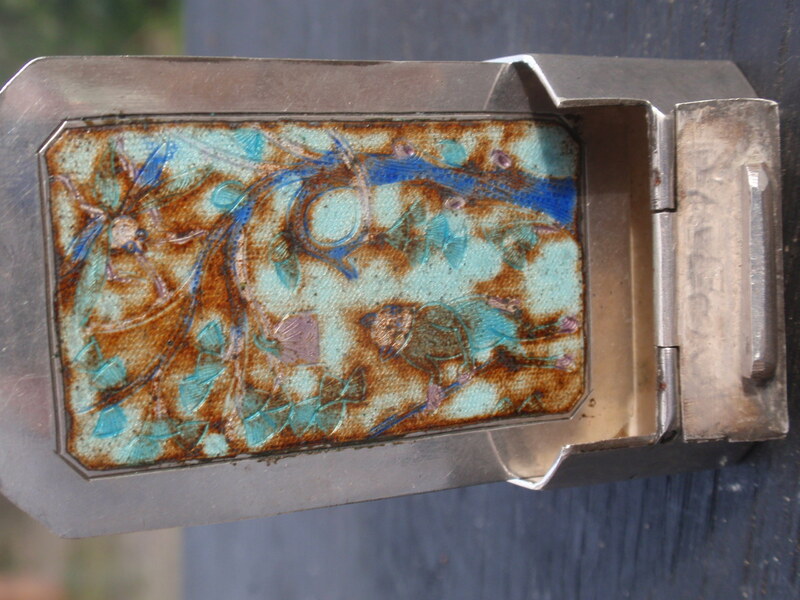 This is a genuine old piece and has wear commensurate with age. 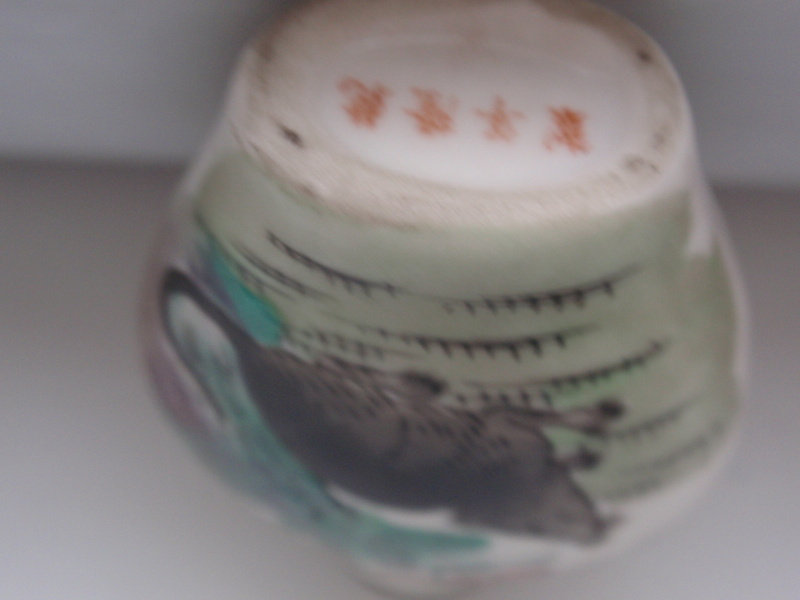 Condition is as the photographs. 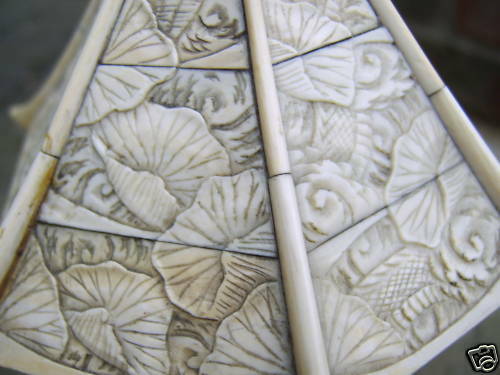 DIEPPE Carved Antique Ox Bone , early 20th Cen., Wood cutter, nice! 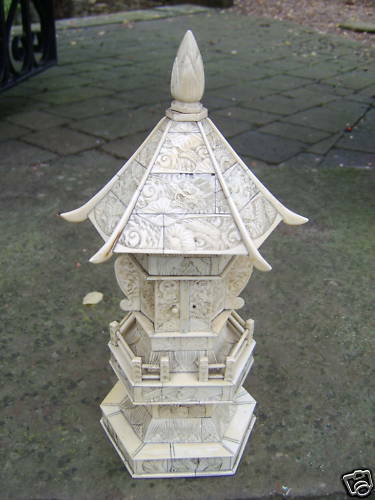 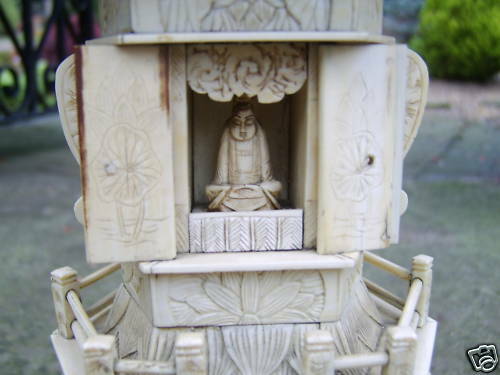 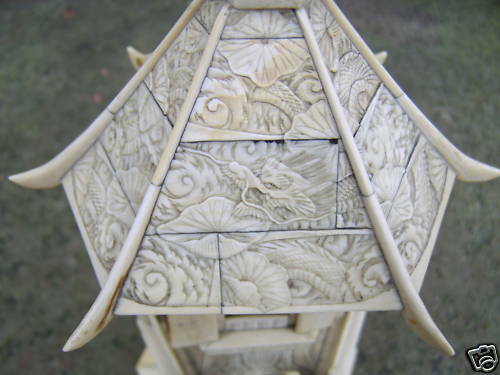 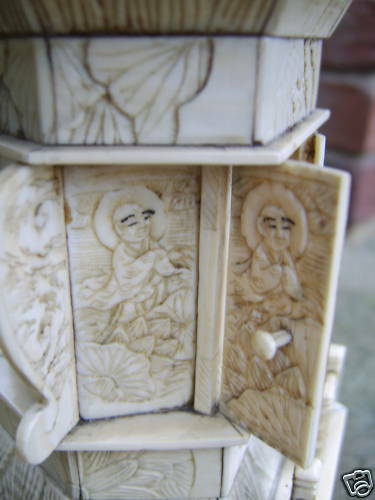 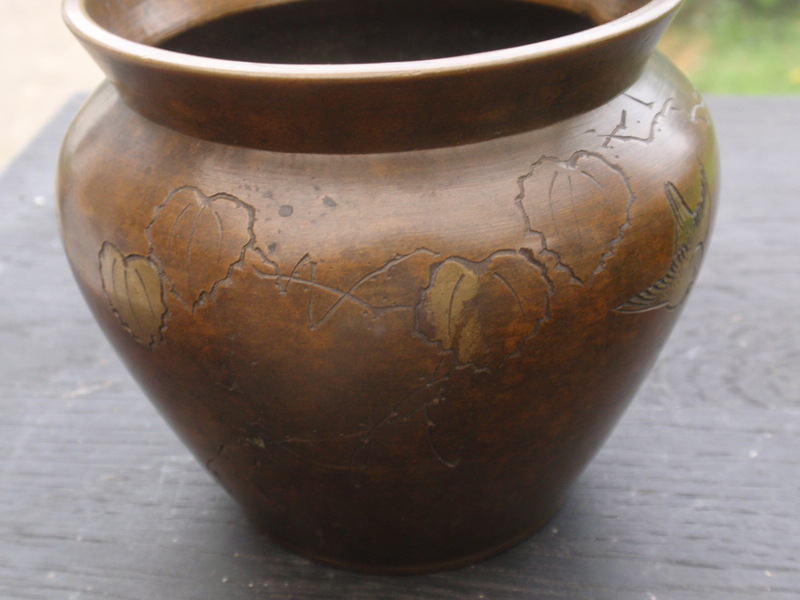 Very Well carved , small details, top condition , no damage. 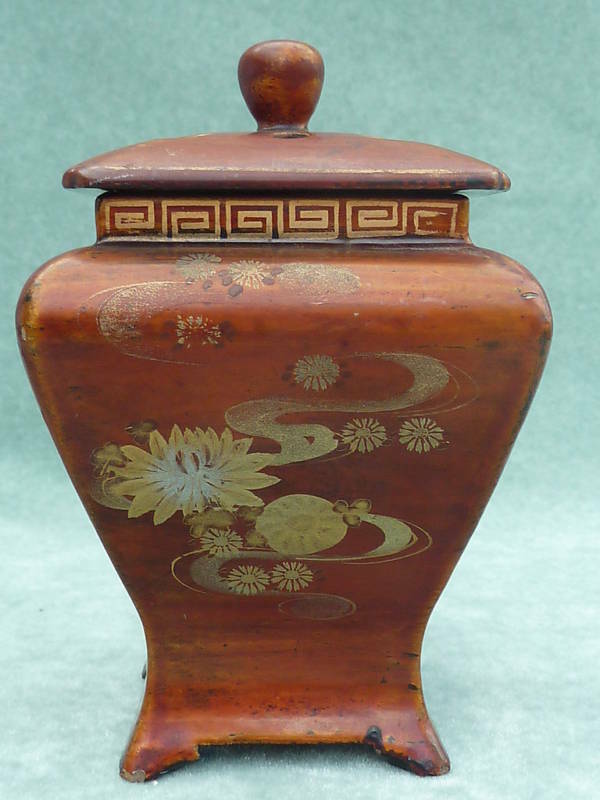 6" Tall (15cm) including the wooden base. 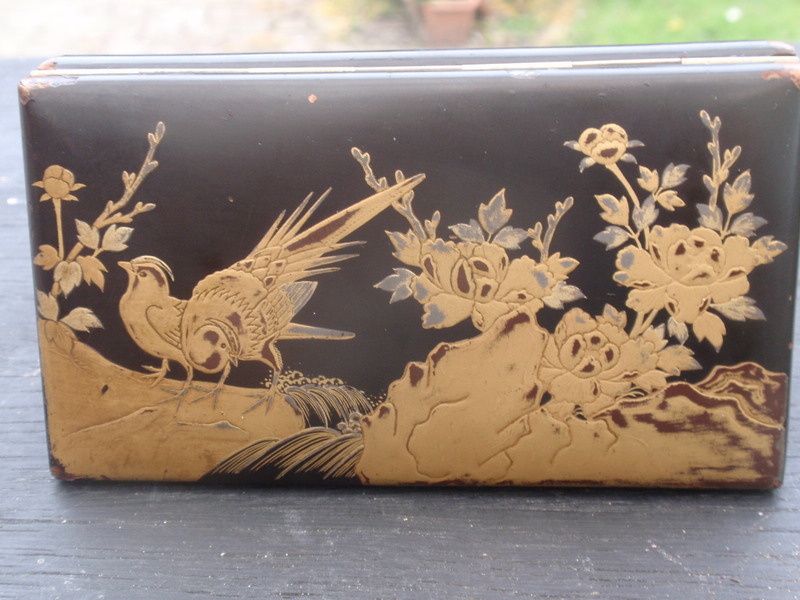 A stunning late 19th. 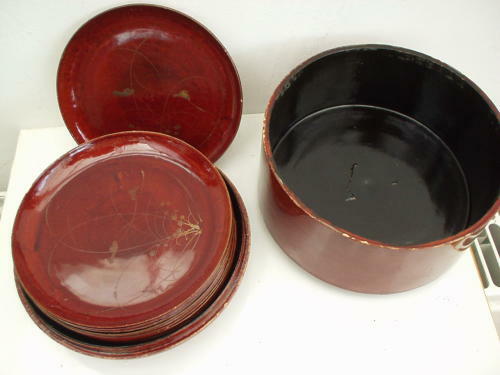 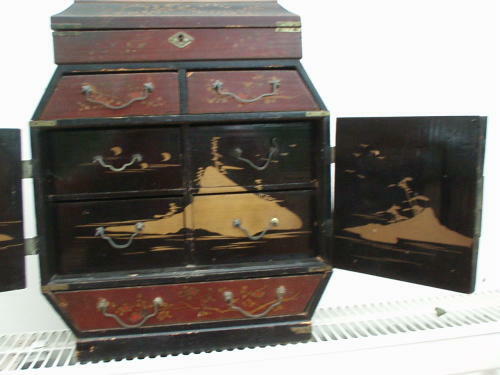 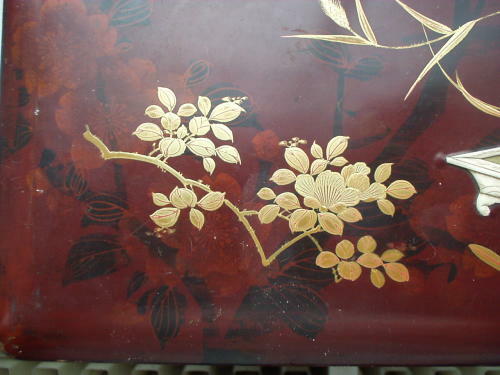 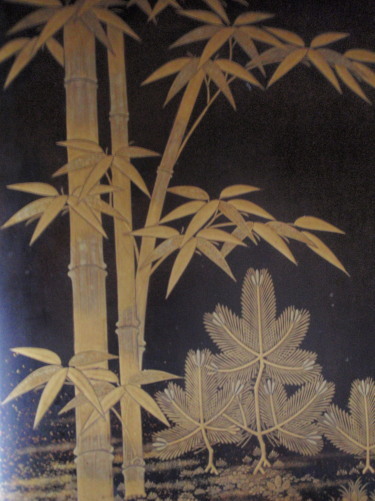 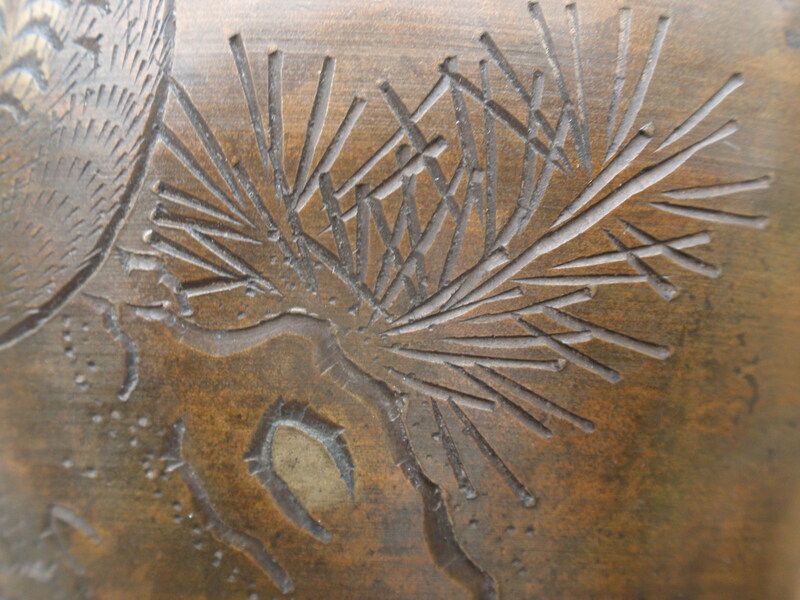 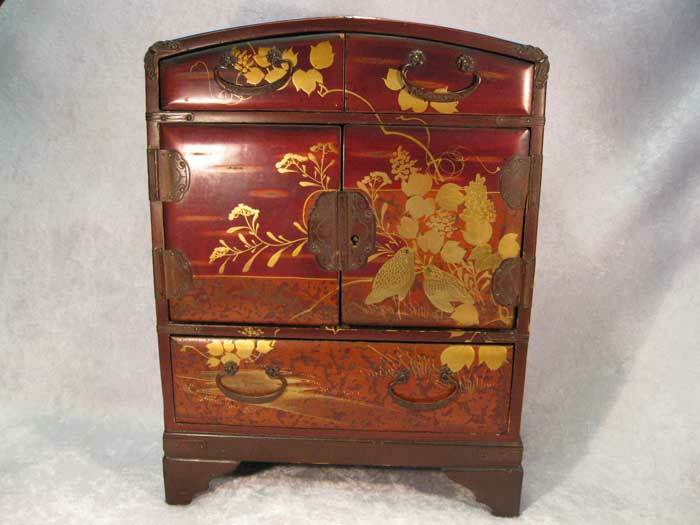 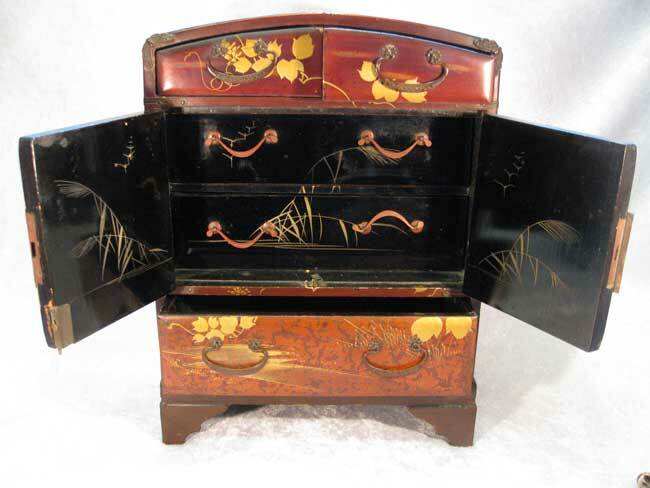 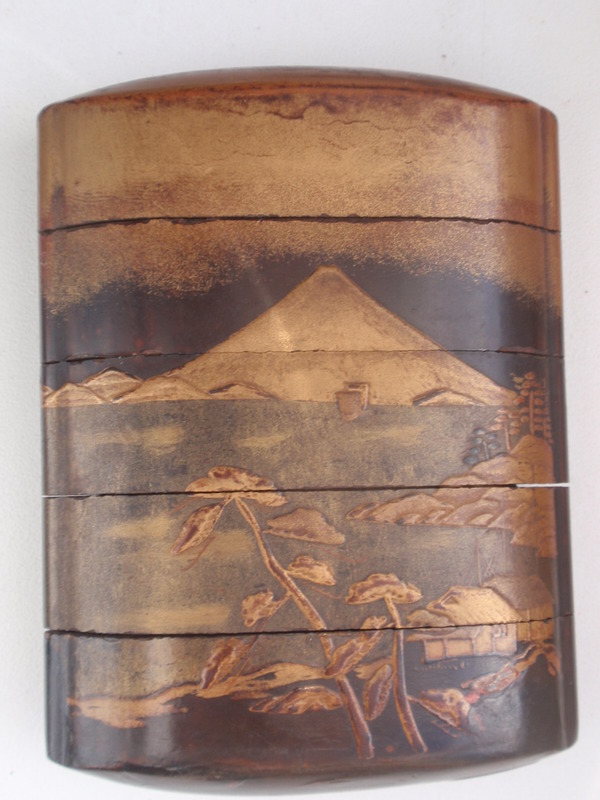 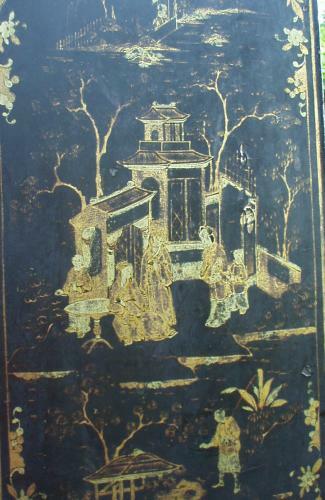 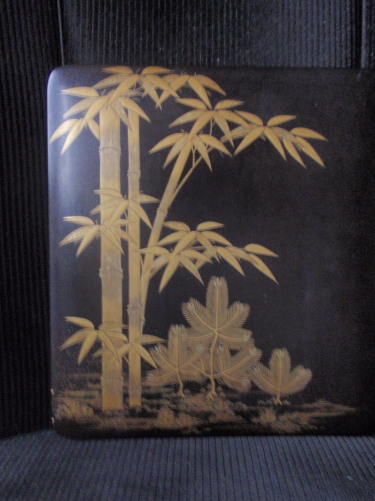 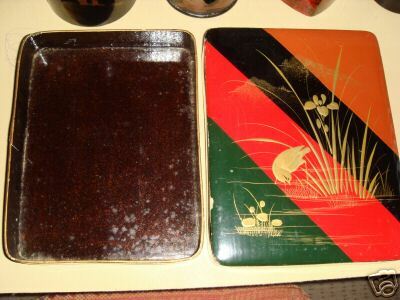 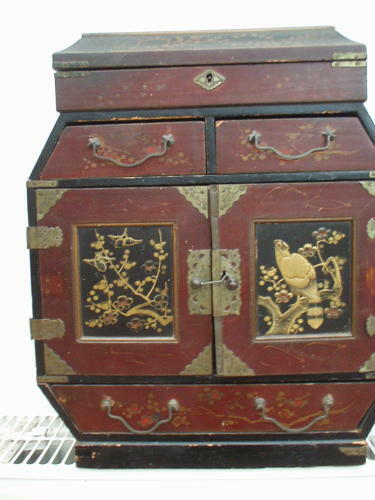 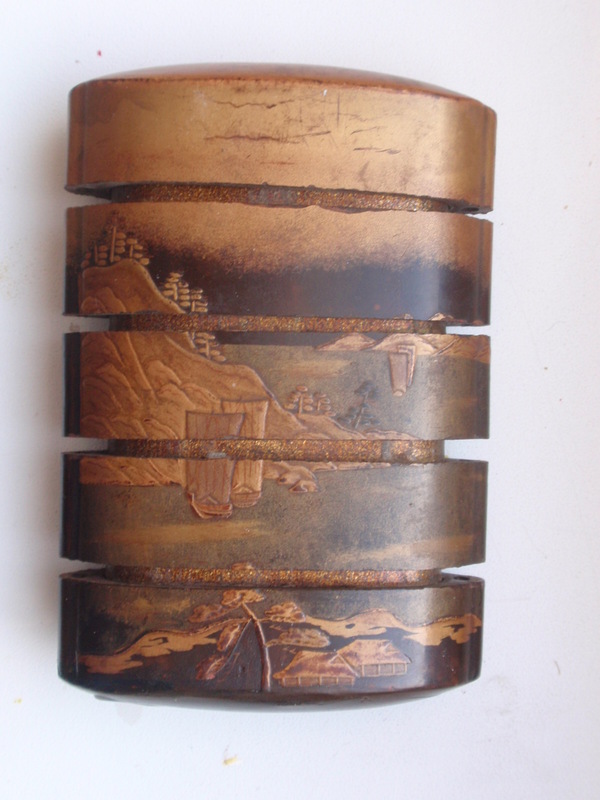 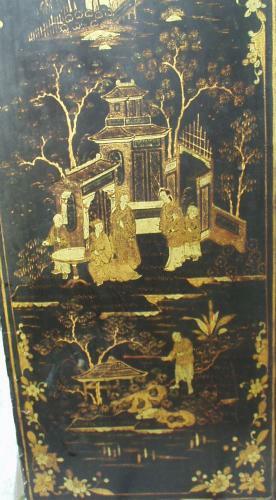 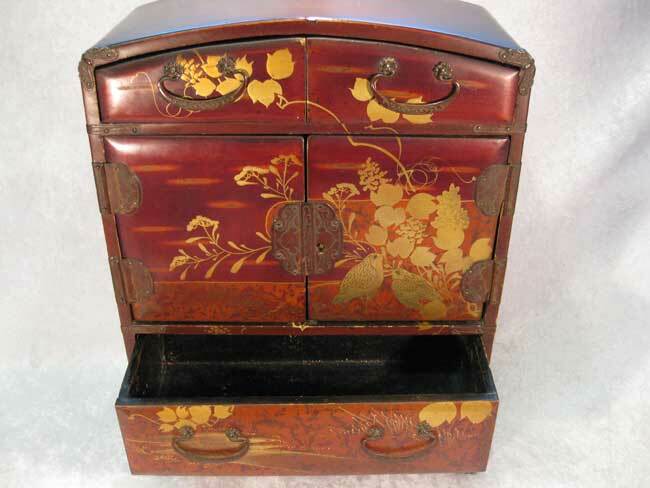 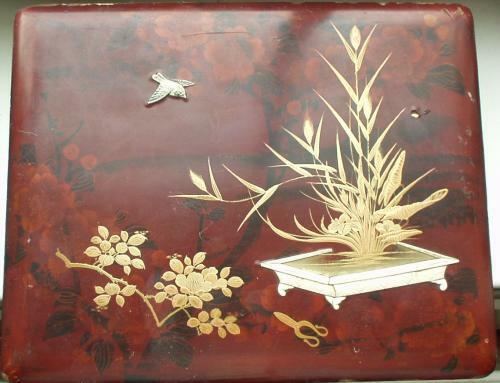 century Japanese lacquered box with high relief detail. 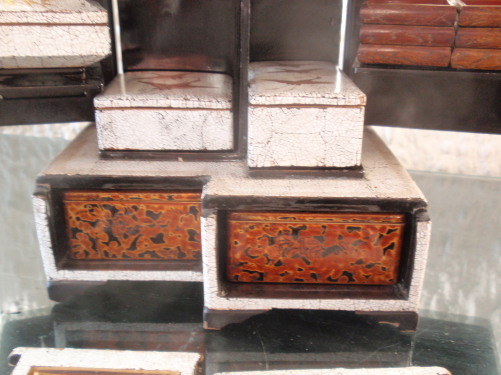 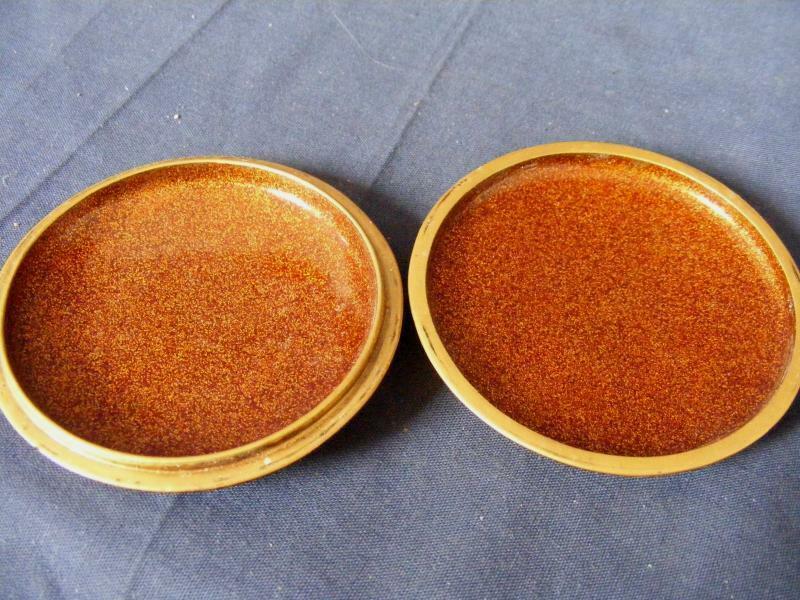 The dimensions are: Width 15 cms, depth 10 cms, height 7 cms. 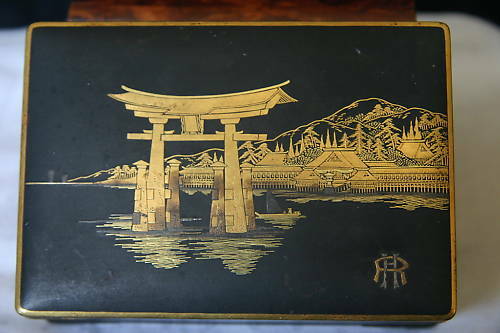 THIS SUPERB ANTIQUE JAPANESE CASKET BY KOMAI OF KYOTO, IS DECORATED WITH VERY INTRICATE DAMASCENE DESIGNS DEPICTING A TEMPLE SURROUNDED BY WATER, WITH A PALACE, MOUNTAINS AND TREES IN THE BACKGROUND . 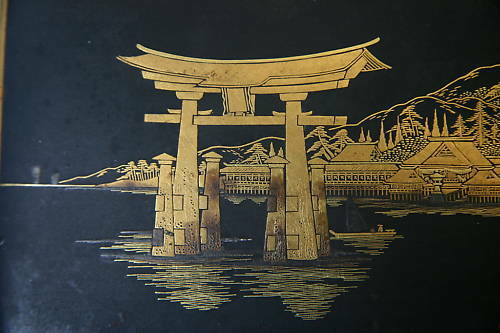 THERE IS ALSO A BOAT SAILING BY THE TEMPLE . 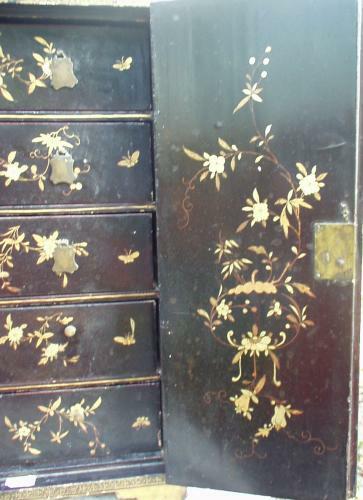 THERE ARE FURTHER DECORATIONS OF BUTTERFLIES ON ALL FOUR SIDES OF THE CASKET (PHOTO TEN) AND THE INSIDE OF THE BOX IS GILDED. 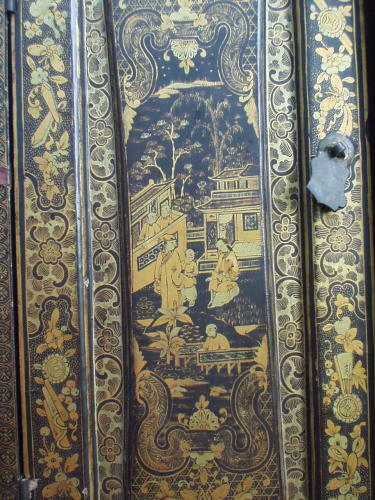 THE DAMASCENE DECORATIONS ARE MADE FROM VERY FINE INLAYS OF DIFFERENT GOLD COLOURS, ON A MATT BLACK LACQUERED BACKGROUND THAT PRODUCES A QUITE STUNNING EFFECT. 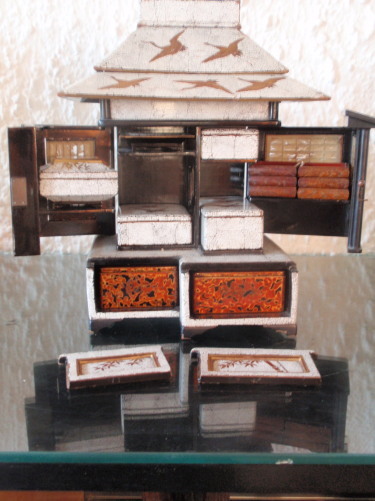 THE IRON CASKET MEASURES 13.5CMS (5.5") LONG X 9.5CMS (4") WIDE X 5.5CMS (2.25") HIGH AND WEIGHS 708g (25OZ). 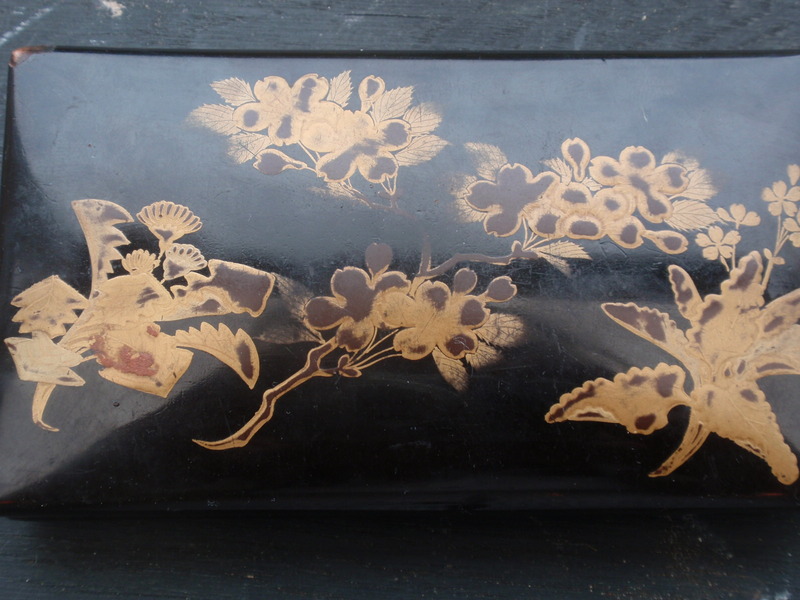 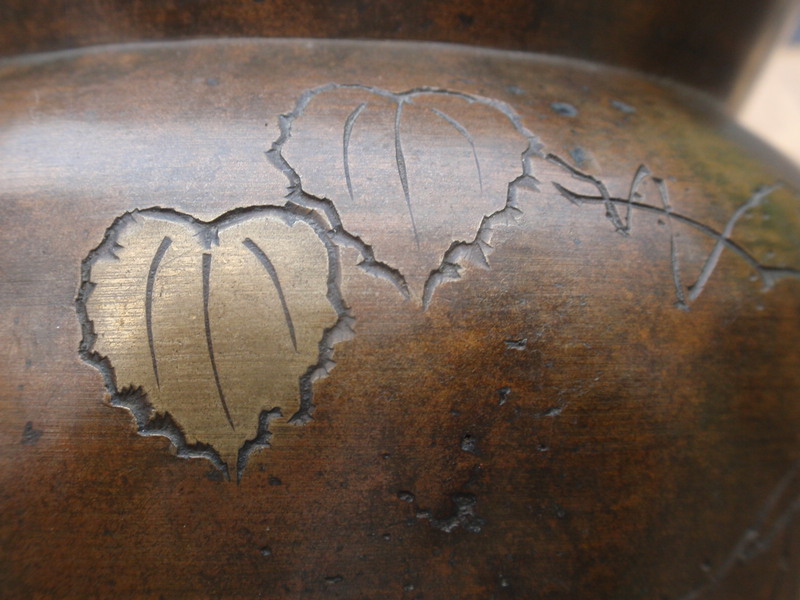 IT STANDS ON FOUR ATTRACTIVE CORNER FEET WITH CURVED DESIGNS AND HAS A CLEAR MAKERS MARK UNDERNEATH, ALONG WITH ''K24'' FOR KOMAI OF KYOTO . 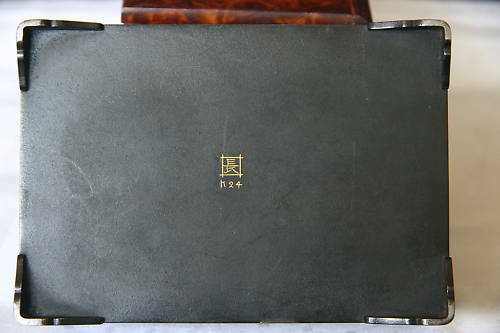 IT ALSO HAS THE INITIALS ''HR'' ON THE FRONT.